It feels like summer over here on The Weekender. Lately I’ve been feeling inspired by times of nostalgia and innocence. Clean simplistic lines and a refined sense of girlish style. Flirty tops and breezy skirts. Gingham, floral motifs, and anything in a shade of rosé are invading my closet. Take these daisy print sunnies and crochet top – creative with a quirky charm all their own. Today’s editorial was a serendipitous event. We were headed downtown planning to shoot a very different feel to this look, but due to unexpected traffic from other events had to relocate. So, we headed to the top of the rooftop parking lot where we found ourselves alone- soaking in the sunshine and blue skies. The wind worked with us (for once!) and it might be the chicest outfit you can think of wearing on an abandoned rooftop. By the way, have you heard, have you heard? Gingham is THE print of this summer. It’s no surprise that I’ve been wearing this gingham skirt since I picked it up (another vintage find – but local this time – House of Dow) with just about anything. It’s the perfect excuse to wear gingham non-stop with my summer tees, tanks and graphic tops without looking boring. 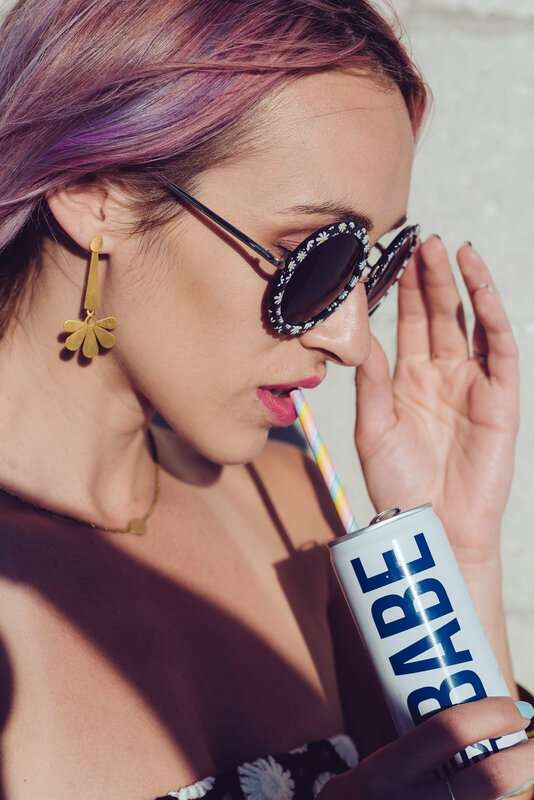 Talking about current addictions… besides millennial pink hair, daisy print and a chilled 4 pack of Babe Rosé (with bubbles) these Noonday Collection Parlor Earrings are the tops. They deserve an award for creative versatility. They can be styled 4 ways – a simple gold stud, dressed up with an extender or ear jacket or the full look. I just can’t deal with how cool they are. You can literally wear a bed sheet and as long as you’ve got these earrings on, you will be the chicest person in the room. Seriously, you should try it! I love how they light up when the sunshine hits them just right. I’m also wearing a Noonday necklace made of artillery from Ethiopia, with a moving story behind it (read here) and these gorge bangles are a wardrobe staple! They come in a set of 5. Every woman should have a neutral stack of bangles in her jewelry box. The largest one is made with natural Mother of Pearl! ***Don't forget, June is an extra special month, as a portion of all Noonday Collection sales support the giveback impact and social needs in Haiti. Noonday is hoping to raise enough funds to build a mother and daughter a home. I can’t think of a better reason to elevate your summer look! There are a few other telltale signs of oncoming summer -these things that make me exited: a sun kissed glow, longer days and campfire nights, the relaxation of enjoying a grilled meal outside on the patio and the anticipation of planning a vacation or weekend get-away. After editing this shoot I am lusting for an adventure with real castle backdrops on a bustling coastline. Where do you plan to travel this season? If I could go anywhere it would be France! Congratulations @oliviaeboney on winning her own set of Parlor Earrings!!! A big thank you to April and all who participated!